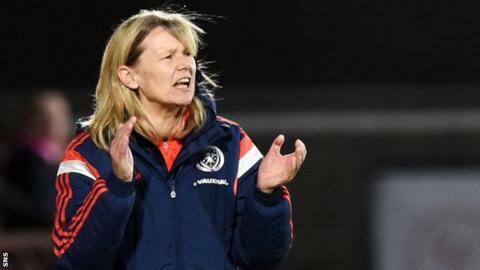 Head coach Anna Signeul has vowed to stay on and lead Scotland to the next European Championship finals despite suffering World Cup disappointment. Her side lost 2-0 in Rotterdam as the Netherlands completed a 4-1 aggregate victory in their play-off. "Absolutely," the Swede replied when asked if she would remain in post. "We will qualify for the Euros in two years' time, that's for sure. We are disappointed, but when you see steady progress, we should be confident." But Signeul called for greater investment in the women's game in Scotland. "I think we need to develop the game on all levels," she told BBC Scotland. "We need more players, we need a better league, a competitive league. "I think it is fantastic that we're up there and so close. I think Holland can be one of the better teams in the World Cup. I think they will beat Italy." "We are very vulnerable when we have so few players, but we have done a fantastic campaign and it's just sad that we can't go on. "We need to continue what we're doing because it's working and we have young players coming through." It was Signeul's third such disappointment with Scotland, having missed out on the World Cup after losing to Russia six years then the last Euros after a last-ditch Spain winner. She was emotionally drained after the defeat by the Dutch but paid tribute to the Scots' opponents. "I think Holland showed they are a very good team," she said. "They are maybe a step ahead of us, but I think we are soon there. They have more experience, but we are getting closer and closer all the time. "We are very consistent. It is just getting results against the best teams that is missing. Glasgow City midfielder Jo Love thinks that she and her team-mates should be proud of their campaign. "We've not got the result we've came for, but I think we've done really well," she said. "We thought we were capable of coming here and fixing the damage that was done at home. "We are just got to keep moving forward and look to the Euros. "Holland are a great side, take nothing away from them, but we are improving at our own rate and feel we are going to be there next time round."